2018 North American Ice Climbing Championships Recap. 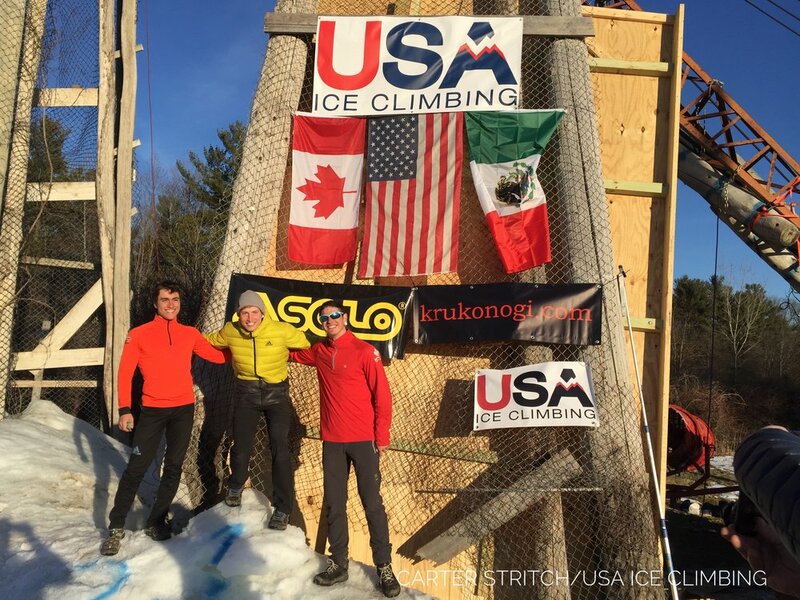 This past weekend thirty two athletes from 4 countries competed at the North American Ice Climbing Championships/Great Lakes Mixed Comp in Fenton Michigan. The competition started off on Saturday morning with a flash format for a combined men's and women's qualifying round. Athletes had four minutes to climb each route and 4 minutes to rest for the next route for a total of 5 routes. The experience level of the athletes ranged from youth athletes competing for their first time to seasoned World Cup athletes. In the afternoon, the speed competition commenced on plywood speed structures instead of ice, due to the warm weather that melted the ice a couple weeks prior. The competition was a duel format. Americans Kevin Lindlau and Catalina Shirley took first place for men and women respectively. Sunday morning brought warm, spring like weather and the lead semi-finals competition. Male and female competitors lead up through the unique structure supported by an old crane. The routes consisted of mostly Korean drytooling holds and a volume (feature added to the climbing wall) that was used in the 2018 Hohhot World Cup competition in China. Eight male and six female finalists progressed to the final round of lead climbing in the afternoon. The women's route made full use of one side of the arched structure and the men's route start included downclimbing the start of the Women's route and then ascending another set of holds into the steepest part of the structure, where the two routes came together. Rebecca Lewis of Canada took first place for women and Kevin Lindlau of USA took first place for men. Rebecca Lewis working her way towards first place on the Women's Finals route. David Bouffard climbing the Men's semifinal lead route. David took third place in the men's lead competition. We would like to thank all of the volunteers who graciously donated their time and effort to ensure that the athletes and spectators had an enjoyable event. Unique climbing event held at Peabody Ice Climbing, the only permanent ice climbing competition structure in North America. Fenton, Michigan - North America’s top competition ice climbing athletes will compete this weekend to be the 2018 North American Champions at Peabody Ice Climbing in Fenton Michigan. The athletes will compete in two disciplines, Difficulty and Speed. This event promises to be a completely unique event in North America and some of the featured athletes have recently returned from Ice Climbing World Cup competitions around the world in Switzerland, Italy, China, South Korea, and Russia. Athletes will demonstrate their gymnastic prowess, strength, and speed over two days of competition. The Difficulty competition will take place on North America’s only competition wall, a 50 ft wood structure with 50 degree overhangs. The Speed competition will be a series of 12m vertical duels between two athletes. Due to the recent warm weather, the speed competition will be taking place on plywood towers instead of ice towers. Competitors will race up the 12m structure in times that could be less than 6 seconds! Spectators are welcome during the whole event and admission is free. Make sure to catch Difficulty Qualifiers starting at 10am and the speed competition on Saturday afternoon starting at 3pm.. On Sunday, difficulty finals start at 3:30pm followed by the award ceremony. About USA Ice Climbing. We are a non profit that supports competitive ice climbing, mixed climbing and drytooling. Competitive ice climbing is a fledgling sport in the USA that is continuing to grow. In 2017 USA Ice Climbing hosted 2 very successful indoor drytooling competitions, wrote drytooling guidelines for climbing gyms, and started a national ranking system. USA Ice climbing continues with these activities in 2018 and also supported youth competitors at the UIAA Ice Climbing Youth Championship and adult competitors at the UIAA Ice Climbing World Cup Tour in Switzerland, Italy, China, and South Korea. About Peabody Ice Climbing. Peabody Ice Climbing is an ice & mixed climbing venue located in Fenton, Michigan on a retired apple orchard. Our venue has become a place for seasoned ice climbers to train for the mountains, and also provides an ideal introduction for beginners in a controlled environment by experienced and certified instructors. UIAA Ice Climbing World Cup. The Ice Climbing World Cup hosted and governed by the UIAA is a world tour of competitions with athletes from 20 countries. More information, photos, and videos can be found at http://www.theuiaa.org/ice-climbing/. The teams that will be representing the USA at the 2018 UIAA Ice Climbing World Cup competitions and the 2018 Youth Ice Climbing World Championships have been selected. Team updates and results can be found at usaiceclimbing.org throughout the competition season! This past weekend Roca Climbing and Fitness in Rochester Minnesota hosted southern Minnesota's first drytooling competition. Twenty six competitors competed. Men, women, youth, beginners and experienced ice and mixed climbers all competed. The competition format was redpoint with a finals round for the top 4 men and top 4 women. USA Ice Climbing looks forward to helping Roca host next years competition! USA Ice Climbing is hosting a drytooling training camp for all levels of youth and adult athletes. The camp is 2 days of climbing, discussion, and camaraderie. Join the training camp for the opportunity to learn a very fun and unique style of climbing from experienced athletes. Peabody Ice Climbing has multiple drytooling structures, on-site accommodation, and is 10 minutes from Fenton, MI restaurants. Open to all athletes 12 years old and over. Athletes welcome from all countries. For detailed information and to register visit the Drytool Camp page. Last weekend with the help of USA Ice Climbing, the University of Minnesota at Duluth (UMD) held their inaugural dry tooling competition. The event brought in many first time drytoolers along with experienced locals. World Cup ice climber Carter Strtich was able to take his knowledge as a climber and apply it as a route setter. “It was cool to see competitors try to figure out the routes. It was especially interesting to see the creative ways a few of the beginners took the holds!” The event offered a variety of routes geared towards first time climbers, as well as difficult routes for those up for the challenge. The Recreational Sports Outdoor Program (RSOP) climbing wall offered a supportive environment for all athletes as well as a great space for spectators from the second floor balcony. The top two competitors for male and female adult and male and female U21 were awarded prizes supplied by the American Alpine Club Twin Cities Chapter and Naf Glass of Lake Superior Art Glass. A huge congratulations to all competitors for their effort and to the volunteers that helped make this event a success! The UIAA has released the provisional dates for the 2018 Ice Climbing World Cup competitions. The calendar will look a little different to last year's with a few locations moving around between months and the addition of four European Cup competitions. View the UIAA announcement here or view the updated USA Ice Climbing calendar. This past weekend USA Ice Climbing athlete Kendra Stritch took 7th place in the overall speed ranking in the 2017 UIAA Ice Climbing World Cup. Check out the video of the Rabenstein Italy World Cup Speed Finals. US Athlete Ryan Vachon takes first place at the 2017 Ouray Mixed Competition! Check out Rock and Ices coverage of the event!